Cardiologist and nutritionist, Stephen Sinatra was frustrated with his patient’s addiction to fast food and their inability to change their eating habits. He came to the conclusion that it was better to work with his patient’s lifestyles rather than attempt to dramatically overhaul their diet. Dr. Sinatra realized that most people are too busy these days to spend a lot of time on food preparation and need a diet that will easily fit into their schedules. 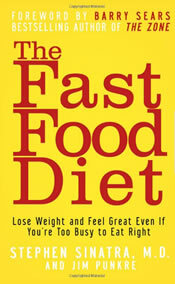 He wrote the book, The Fast Food Diet, to give dieters the information necessary so that they can make healthier choices. Sinatra claims dieters can lose up to 100 pounds in the first year without having to give up fast foods. The basic premise outlined by Sinatra is that if dieters eat healthy foods 80% if the time then it is ok to indulge for the other 20%. As such fast food consumption is to be limited to 20% of the daily diet with the remainder of the diet coming from healthy foods such as fruits, vegetables, whole grains, low-fat dairy, and lean meats. French fries and sodas are not part of the plan and in fact all fried foods should be avoided because they are a source of the extremely unhealthy trans fats. Dieters are provided with information so that they are able to make lower calorie choices in fast food restaurants. Selecting grilled chicken rather than fried. Substituting baked potato for French fries. Drinking carbonated water with lemon in place of soda. The book includes a six-week menu plan, which provides a calorie allowance of 1500 calories per day for women and 1800 for men. Nutritional supplements are recommended to make up for the shortcomings of a reduced calorie diet that allows the intake of processed foods. Walking is the recommended exercise and dieters are advised use a pedometer to measure their level of activity and to work up to 10000 steps per day. These exercises can be used with the Fast Food Diet to promote weight loss. The Fast Food Diet retails at $14.95. The recommended supplements could become quite expensive if their intake is maintained over the long term. Good for dieters with a busy lifestyle. Includes a comprehensive six-week plan. Provides guidance for eating out in restaurants and shopping malls. Outlines the importance of the glycemic index for health and appetite control. Encourages the intake of fruit and vegetables. May benefit dieters who are unable or don’t want to give up their addiction to fast foods. Includes recipes for meals that can be prepared in 15 minutes or less. Acknowledges the importance of exercise for an effective weight loss plan. Supports the intake of unhealthy fast foods. Very difficult to obtain an adequate nutritional intake without the inclusion of supplements. Requires a multivitamin and mineral, additional calcium, fish oil and dietary fiber. Does not provide a maintenance plan for dieters to follow when they have reached their goal weight. Rebound weight gain is likely if dieters are not successful in incorporating healthy changes into their lifestyle. Does not really apply to dieters who generally cook their own meals. Even though this diet plan gives dieters the information necessary in order to reduce calorie intake it still supports the intake of fast foods, which will undoubtedly contain unhealthy ingredients regardless of the choices made. Even the author of the plan acknowledges that fast foods contain substances that increase free radical exposure causing inflammation and possibly increasing the risk of many diseases including cancer. It may be an improvement on the standard diet of those who eat a lot of fast foods and could be beneficial as a first step to improving nutrition but for dieters with their long-term health in mind it will be necessary to look beyond fast foods to a more healthful approach to eating. Chandon, P., & Wansink, B. (2007). The biasing health halos of fast‐food restaurant health claims: lower calorie estimates and higher side‐dish consumption intentions. Journal of Consumer Research, 34(3), 301-314.
i did this lost nothing probably gained did everything stupid diet.